In looking for information about sales and sellers of works of art, it is sometimes necessary to turn to contemporary newspapers, correspondence, and other primary-source materials. In particular, finding information about the buyer of a work is difficult as auction houses rarely report this information. Often the only source of information about a buyer is an annotated auction catalog, an article announcing the sale of a work, or the papers of an artist, dealer, or collector. Works sold at auction are rarely announced in the press, but it does happen in some cases. Try checking the following sources to find contemporary articles or advertisements announcing sales or reporting on works sold. Full-text. Indexes the Chicago Tribune, Los Angeles Times, New York Times, Wall Street Journal, and Washington Post, and other major American newspapers from all over the country. Coverage varies from publication to publication; papers are indexed from their inception and start dates range from 1851 to 1890. Find advertisements, announcements, reviews, and articles. Artists' papers can be an important source of information about works commissioned or sold, as can the correspondence of well-known dealers and collectors. The AAA is a rich collection of the papers of American artists, dealers, collectors, and art historians; most of the collections have been microfilmed and are available through Interlibrary Loan and ongoing digitization projects are making other collections available via the internet. ArchiveGrid is a database of archival materials not necessarily related to art, and can thus be used to find the papers and correspondence of people outside the art world. Advertisement in the Times of London, May 30, 1818. This advertisement was found by searching the London Times Digital Archive and limiting the search to advertisements. Gossip column in "The Crayon"
The so-called gossip columns in art journals can be very good sources of information about works of art sold, commissioned, and exhibited. This article was found using Index to Nineteenth-Century American Art Periodicals. 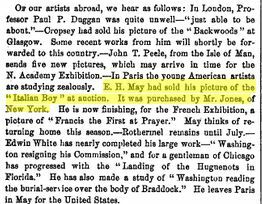 Note, for example, that this article names the buyer of a work by E.H. May sold at auction, information that would not appear in the auction catalog and in most cases would not be divulged in the price list of works sold. Much of the archival material has been microfilmed; AAA microfilm can be requested on interlibrary loan.